I think I might be slightly in love with my new slow cooker. Either that, or it’s just this recipe. I haven’t used my slow cooker enough yet to know what it was about this dish that made it so good, but either way, you really should make this. I didn’t just eat this, I devoured it. It was not a pretty sight. This is definitely a new favourite. I know I say that a lot, but… I guess I have a lot of favourites. This is near the top of the list though! It was also so simple to make, which as you may have gathered, is a very big selling point in my book. I’m pretty big on the lazy. If you don’t have a slow cooker, don’t fret – I’m sure this would also be wonderful done on the hob. Just please don’t simmer it for 4 hours or your mushrooms may shrivel away to nothing – half an hour should be plenty. In a large pan, melt the butter and gently cook the onion and mushroom for 5-10 minutes, until they are slightly softened and beginning to shrink in size, but are still not yet fully cooked. Transfer these to the slow cooker, and add the stock, kethcup, paprika and sliced garlic. Cook on high for 4 hours. When cooked, stir in the sour cream and chopped parsley. 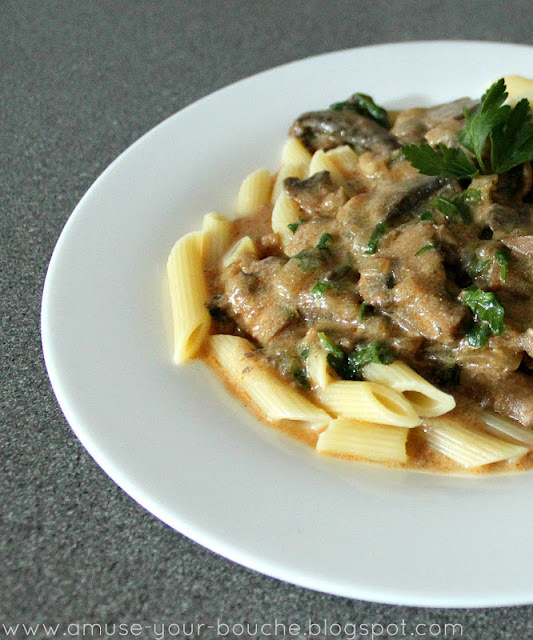 I liked my stroganoff as it was, but if you would like it to be thicker, just transfer it to a saucepan and simmer for 10 minutes to reduce it slightly. I accidentally misread tsp for tbsp and used 3 (hefty) tablespoons of paprika! What can I do! I can’t really compensate with more water/stock, as it’s watery enough as it is. And I can’t drain the water out and re-do because I’d lose the juice/butter/flavour from the fried mushroom and onion! Is it the end of the world? 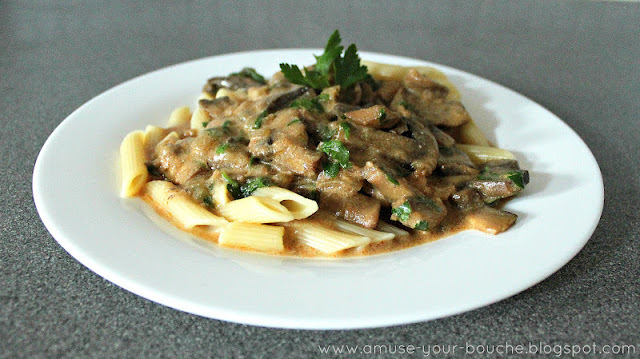 Will it not taste like a stroganoff? Or will it just be 3x as fiery? Lovely recipe though, thank you. It ended up actually tasting fantastic! Paprika levels worked for me; I imagine if I did less I wouldn’t have liked it as much. I found that heating it up the next day in a pan, adding a splash more sour creme and a squeeze of lemon really did the trick! Thanks for the recipe Becca. i made this yesterday for a family party. While everyone said it tasted nice (i don’t eat mushrooms so never tried it), it was very very very wet. I probably over cooked it trying to get it to thicken up. I’d scale down the water content if i were to ever try this again. Glad you liked it! :) If I need to thicken something up in the slow cooker and I have time, I usually just turn it up to high, take the lid off, and let it cook for another half hour or so. But that’s just because I’m lazy haha. To be honest the updated recipe is much the same, mostly just better photos! Do you think it’ll work just as well if I swap the sour cream out for coconut cream? We’re dairy free and would really love to try this out. Really hope you enjoy it, let me know how you get on if you think of it! Hello! I was wondering how well this recipe holds up during the week? I would love to use it as a possible lunch option for several days. Just found your site a couple of days ago and made this tonight. I’m eating it right now over a baked potato, with a little extra sour cream, and it’s PHENOMENAL. Hi, I was wondering if you could tell me how many quarts your slow cooker is? I have a mini one and I would need to figure out how to size the recipe down appropriately. Hi Vi, mine is about 3.5 litres, which Google tells me is around 3 quarts :) enjoy! Just tried making this. Super easy but AMAZING. Definitely will be making it again. What kind of mushrooms did you use? Will baby portabellos work okay? This recipe had excellent flavor and was great served over rice. However I added a bit too much broth so it was saucier than I would have liked but I recommend it! I cooked this today…added a little Worcestershire sauce and a can of cream of mushroom…then served over spaghetti squash in place of pasta. It was delicious! I really enjoyed this but had to cook it down on the stove. I used smokey paprika as I didn’t have any sweet paprika and thankfully only put in 1 teaspoon as it was a bit strong. I also used Tofutti ‘sour cream’ to make it vegan – thank you for sharing your recipe. I’m gonna try this tomorrow… I’ll be out of the house all day… is it ok to put the slow cooker on low for 8 hours instead of high for 4? Great; thanks! Will try this out; sounds yummy! I just made this and it turned out really good! I devoured it too. Thanks for this recipe! I read your reference to it on Liam’s website (Is Carb A Butter?) and had to check it out. Great photos, too! Going to try it soon. Allen. yummy and simple, sounds and looks delish! That does look really good! I always love a good slow cooker recipe.